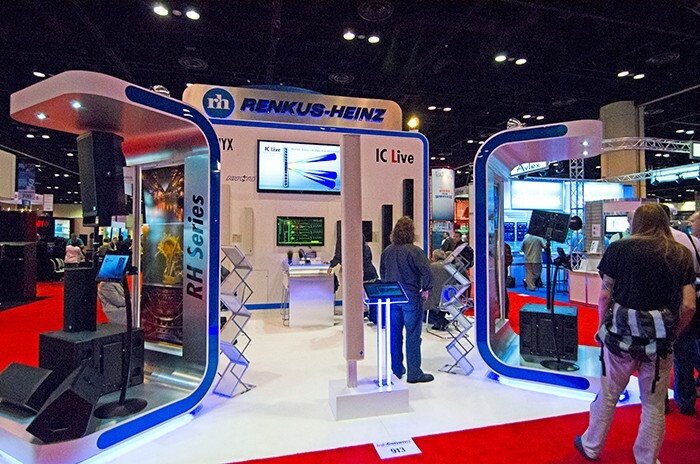 Another InfoComm Convention has come and gone, and Renkus-Heinz has once again enjoyed a fun and successful show. The Renkus-Heinz Booth on the show floor was pulsing with activity throughout the show's three days, with visits from customers and interested attendees checking out the latest in groundbreaking audio technology, including the full line of Iconyx digitally steerable line array systems, IC Live, and IC Live Dual systems, as well as IC2, and all configurations of third-generation IC-R-II systems with triple tweeter technology. At the front of the booth, VP of Sales and Marketing Rik Kirby offered a powerful and effective demonstration of Iconyx beam steering technology. Click here to view the short video. Also on display was the highly acclaimed VARIA line of modular point source array loudspeakers, as well as the hot new RH Series loudspeakers. And well-timed with the announcement of Renkus-Heinz's membership in the AVNU Alliance, Renkus-Heinz also showed the new Iconyx with integrated AVB, as well as a preview of the upcoming RHAON 2. And Renkus-Heinz was the Official Loudspeaker Sponsor for the Technologies for Worship Pavilion, providing a full IC Live system with IC215S subwoofers. In Demo Room 204B, senior vice president Ralph Heinz held forth with ongoing demos of a range of new products. Most sessions were full to capacity, with show goers eager to see and hear the latest in Renkus-Heinz technologies including Iconyx, IC2, IC Live, RH Series, and VARIA. Carrying on one of InfoComm's most enduring traditions, this year marked the 22nd annual Renkus-Heinz Consultants' Breakfast. Well attended as always, this year's event featured insightful presentations from Biamp Systems Executive VP Matt Czyzewski, Hughes Associates Principal Wayne D. Moore, and Sander van Wijngaarden, MD at Embedded Acoustics.